♥Harmony Jewelry is a famous jewelry brand . We provide best service include 24 hours response, 100% satisfied sold out service. ♥ We promise that we use Factual description, Real photo, Genuine 925 Sterling Silver and if less than 92.5% silver, we will 3 times money pay back! ♥Please take care about the jewelry size when you purchase. Usually the sterling jewelry is smaller than the brass or alloy jewelry. Polishing cloths are an excellent choice for cleaning your sterling silver jewelry if oxidized and black. ♥ 90 days free risk money back to protect you when you receive any defected order, welcome any test of our jewelry. ♥Silver should not come into contact with harsh household chemicals such as bleach, ammonia, or chlorine. ♥To avoid scratches, store silver in a lined jewelry box or pouch, as it is prone to tarnish as it naturally reacts with sulfur or hydrogen sulfide in the air. ♥Cleaning and wearing silver jewelry regularly will prevent this and help maintain its shine. Immediately upon noticing any discoloration, use a gentle polish made specifically for removing tarnish. 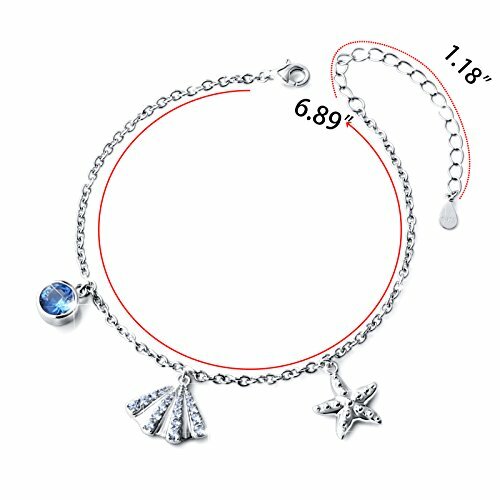 This is a seashell and starfish bracelet with blue CZ. The bracelet is one of our ocean series . Hope to watch the sea everyday. Size : Adjustable Chain Design (17.5 cm+3 cm extension) to fit different wrist sizes. Package ：1 * Bracelet , 1 * Gift Box, 1 * Cleaning Cloth ; You can send it to your friend directly. SILVER MOUNTAIN provide high quality jewelry and the best customer service, if you have any problems please don't hesitate to contact us, we will try our best to help you. If you have any questions about this product by SILVER MOUNTAIN, contact us by completing and submitting the form below. If you are looking for a specif part number, please include it with your message.